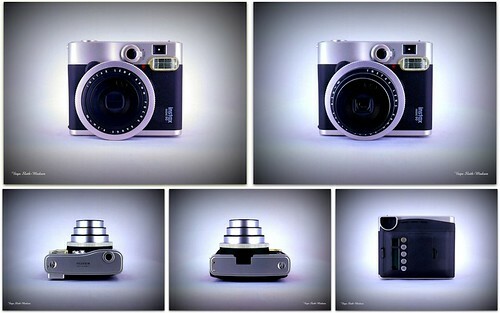 The Instax Mini 90 is a instant camera that uses Instax Mini film and manufactured by the Japanese company Fujifilm and available widely in 2013. The camera is branded as Neo Classic. The design of the camera has a retro classic style with leatherette that looks similar to Fujifilm's X series digital cameras released years prior. It uses a motorized 60mm f/12.7 lens with three focusing modes. Normal mode with a focusing distance of 0.6m to 3m , landscape mode for 3m to inf and a macro mode from 0.3 to 0.6m. The shutter is capable of 1/3 to 1/400 of a sec. There are two shutter release buttons to make it easier to compose in different orientations. There are a number of additional exposure modes that can be adjusted by pressing the mode buttion, party mode, kids mode, landscape mode, double exposure and there is also a bulb mode for up to 10 seconds of exposure. The brightness can be adjusted by pressing the LD button, to can adjust from normal to bright L, bright L+ and dark -. The flash function can be adjusted from on, red eye and flash off. There is a self-timer mode with a delay of approx. 7 seconds. A two shot timer mode takes an additional photo 3 seconds after the first. It is powered by a NP-45A lithium-ion battery that can last approx 10 packs of film. This page was last edited on 16 February 2015, at 04:20.